April 20 marked the 155th anniversary since Seton Hall University received its official charter from the New Jersey State Legislature. 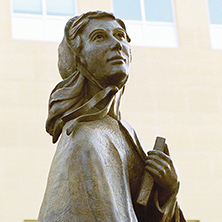 The annual Charter Day Convocation celebrated 160 years since Seton Hall was founded in 1856, 155 years since SHU was officially recognized by the state, 195 years since the death of Mother Elizabeth Ann Seton, and 65 years since Seton Hall was granted University status. At the convocation, President Gabriel Esteban welcomed those who attended the event, and explained why SHU’s charter is so important. Charter Day “reflects on Catholic identity and the students that the university serves,” Esteban said. “We remain steadfast in our commitment to serving students from all walks of life.” Esteban continued. He also said the 2016 student Servant Leader Scholars, who were honored at the event, are Seton Hall’s “living embodiment” for the future. Associate Professor John Shannon from the Department of Economics and Legal Studies gave a keynote presentation at the convocation about SHU’s motto “Hazard Zet Forward,” which he argued remains a valuable mindset for the Seton Hall community. Shannon translated the motto as, “move forward despite challenge.” He said the message that the motto provided was clear and that any student attending SHU can overcome all obstacles. The obstacle that Shannon said SHU students today experience is the unknown of the constant changing future. He said that professors at the university cannot use the past to help students predict what will happen in the future. The Seton Hall community must adapt to the changing world, Shannon told the convocation. “We must develop and nurture learning environments that help students become flexible, adaptable, imaginative, resilient and ethical.” Shannon said. Shannon also mentioned Seton Hall alum and how they understood “a SHU education helped build an ethical framework and way of life” for them. “This is one of the most important gifts of the Seton Hall experience.” Shannon said, referring to the ‘ethical framework’ that SHU alum said they gained. Once the “Hazard Zet Forward” presentation was complete, the Bishop Bernard J. McQuaid Medal for Distinguished Service was given to Mary M. Balkun, professor of English and Chairperson of the English department. The medal is awarded by nomination of the University President and expresses thanks to those in the university community that selflessly served Seton Hall. Forty two student Servant Leader Scholars were also honored at the event, six being graduating seniors Nicole Archibald, Jessica Card, Nicole Dellera, Andrew Dill, Ryan Hardardt, and Joel Menendez. Ashley Turner can be reached at ashley.turner1@student.shu.edu.